David and I used to talk about our honeymoon before we even talked about getting married, and deciding to go to Vietnam was easy. As an avid cook and food lover, I was eager for a culinary adventure. As an avid eater, so was David. We wanted to visit a country that would still be warm in November, and we wanted to be able to live like kings on a budget. Vietnam fit the bill on all counts. I started with the travel books 9 months before the wedding. Every day on the New York City subway I’d be carried away to Vietnam, always prepared with post-it notes, pencils, a Rough Guide and a Lonely Planet. Narrowing down the cities we wanted to visit during our two weeks was going to be a huge challenge, because everything sounded amazing. After weeks of research, we finally nailed down a rough itinerary, and announced our trip on Traveler’s Joy. On November 2, 2009, the day we departed for Vietnam, David and I were happy newlyweds. Our Halloween wedding in Hollywood, California was perfect, and everyone complied with our “formal attire from any era” costume theme. We were filled with wonderful memories that already seemed too distant, but were so excited and ready to make new ones. When we landed in Hanoi in the evening, we were greeted by a driver sent by the hotel with a slick black BMW who transported us in style to the beautiful Hilton Hanoi Opera. The star treatment continued when we checked in. The hotel’s general manager, who knew that I am the assistant to the CEO of the company that owns Hilton, gave us the Presidential Suite for only $100 per night. In our room we found a plate of the most beautiful and delicate French pastries, a basket of fresh ripe fruits, and a chilled bottle of champagne. The suite, which was roughly four times bigger than our tiny New York apartment, was stunning. There were fresh flowers everywhere, the entire bathroom was made of marble, and we had access to the executive lounge that provided free breakfast, cocktails, and Internet. It was amazing. 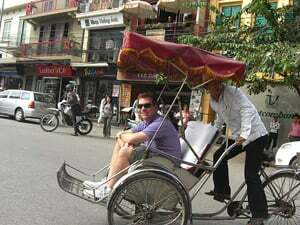 Our first day in Hanoi started with a cyclo ride through the city. A rickety metal seat and frame attached to a bicycle, the cyclo is an equally fun and terrifying way to get around. The driver pedaled into the busy street and we were assaulted with the sound of horns honking and the smells of exhaust from the motorbikes. Traffic laws are enthusiastically ignored in Hanoi, so we almost died several times that morning. The cyclo took us to the Old Quarter, where we spent hours walking around the thousand-year-old streets. The most striking thing about the area was that the sidewalk was an extension of the ground floor shops and homes. Makeshift restaurants, motorbikes, and blankets with knick-knacks filled the sidewalks. We weaved through the streets with a feeling as if we were walking through kitchens and living rooms. This made strolling difficult, but it exposed the details of everyday life in Hanoi, and gave us a glimpse into old Vietnamese culture. We stopped into a foot massage parlor and each had an invigorating 30-minute massage. We took a walk around Hoan Kiem Lake, and made our way to a restaurant called Quan An Ngon. Our guidebook raved about it, and inside we found a mix of both tourists and locals, which is always a good sign. Quan An Ngon brings street food indoors, and as David was hesitant to eat food from the street, this was the perfect way to delve into the cuisine that is eaten by most Vietnamese. We ate squid with chili and lime, battered and fried shrimps that are eaten with the shell on from head to tail, and wide noodles with beef and water spinach. The food was amazing! Our cyclo ride back to the hotel, however, was not. We foolishly did not negotiate a price with the cyclo driver before getting in, and we ended up paying about $20 for what should have been a $5 service. Fortunately, it was an inexpensive mistake. After our afternoon swim and nap, we headed back to the Old Quarter to see a water puppet theater performance. Water puppetry is a distinctively Vietnamese art form, and we had never seen anything like it. For dinner that night we decided to splurge (a relative term in Vietnam where everything is cheap by American standards) and made a reservation at Wild Rice, a place our guidebook hailed as an upscale restaurant serving traditional Vietnamese cuisine. It was lovely and beautiful, but the food was bland. We craved spicy and sour and pungent flavors that are so prevalent in Vietnamese dishes. We deemed the restaurant a tourist trap and vowed to make Wild Rice our last taste of upscale Vietnamese cooking. On our second day in Hanoi, we took a taxi to the Ho Chi Minh mausoleum complex. It was a respite of calm amid the city of motorbike traffic. The green parks were a pleasure to stroll around, and the limited number of tourists gave us room to breathe. We wanted to see Ho Chi Minh lying in repose at the mausoleum, but he was on “vacation” in Russia for touch-ups, so sadly we missed him. We saw the home that Ho Chi Minh lived in, which was right across the lawn from the home he could have lived in but chose not to - a big, yellow, beautifully restored French colonial mansion that is now used for government events. We weren’t allowed inside but it was so beautiful to look at. We also visited the Temple of Literature, an impressive thousand-year-old Confucian university. After massages and facials at a spa, we headed back to the hotel for our afternoon swim and nap, and decided to stay in for the night, taking advantage of the free cocktails and small bites in the executive lounge. In the morning, we took a taxi to Hanoi Backpackers youth hostel where we had signed up for an overnight trip to Halong Bay. For $109 per person we received transportation by bus to Halong Bay, a night on a boat, all meals on the boat, and a bus ride back to Hanoi. We considered a luxury trip for a higher cost, but a friend recommended that we take the less costly trip so we would be on a boat with a younger crowd. It ended up being really good advice, and the trip was paid for by a friend who purchased it for us from Traveler’s Joy. The ride to Halong Bay was fascinating, as we got to see what life looks like in the countryside of Vietnam. We arrived in four hours and boarded the Jolly Roger, a traditional Vietnamese junk boat. As honeymooners, we were given the best room on the boat with a semi-private deck, where we went to sit and gaze at the hundreds of spectacular karst islands we sailed around. We suntanned all day, kayaked, swam, drank beers and chatted with our fellow travelers. The food on the boat was terrific and the drinks flowed all night. After a day in the sun though we were exhausted and fell asleep before anyone else on the ship. I was the first to wake up the next day and I spent the early morning taking pictures of the bay. The best thing about Halong Bay is that even with a cheap camera, photos of the mountainous islands in the morning mist look amazing. Later in the day I soaked up more sun while David jumped off the boat and swam. After another fantastic lunch we pulled back up to the dock and boarded the bus back to Hanoi. Once back at the hostel, we immediately got in a taxi and headed for the airport to catch our flight to the ancient town of Hoi An where we were to spend the next two nights. Our flight was less than an hour long, and at $39 per ticket, a bargain as well. 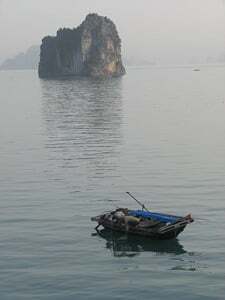 We got to our hotel, the Vinh Hung, which we read about in Lonely Planet. Situated in an old Chinese merchants’ house in the most desirable part of town, the Vinh Hung was recently renovated and furnished with Chinese antiques. The small hotel was every bit as beautiful and special as we had hoped, and it provided a nice contrast to the larger resort hotels we chose for the rest of our trip. It was late when we checked in, so we headed towards the river and ate at the only place still serving food. Hoi An has three culinary specialties: Kao Lau, a roast pork and noodle dish; White Rose, a steamed dumpling with shrimp; and fried wontons, filled with pork and topped with a mixture of tomatoes, garlic, and shrimp or crab. We didn’t have high hopes for the only open restaurant in town, but we had all three specialties, and they were all delicious. Hoi An is famous for its skilled tailors, so in the morning we went to A Dong Silk, a shop that Lonely Planet praised. Thanks to gifts we were given through Traveler’s Joy to have clothes made, we had money to spend. After we each were measured thoroughly, we picked out fabrics and made an appointment for fittings. With that important task out of the way, we explored Hoi An. The entire city is a UNESCO World Heritage site and has remained preserved for many years. The town’s main structures are Chinese, Japanese, or French, reflecting the various countries that have ruled Vietnam in the past. The architecture in Vietnam, and Hoi An in particular, is so varied that one could simply look at buildings all day and never tire. But, it was 85 degrees and humid, so after a couple of hours of sightseeing we headed to Cua Dai beach, a 10 minute taxi ride outside of Hoi An. Cua Dai beach is a strip of restaurants and lounge chairs on the sand that offers swimming, sunbathing, and fresh seafood. We picked out a couple of lounges and ordered lunch from a kid who said his dad catches the fish and his mom cooks it. We had shrimp in tamarind sauce with rice and we drank beers in the cool shade. We met a nice local kid on the beach, and bought three of his hand-painted postcards. Later, we saw hundreds of the same post cards at cheap souvenir shops. It was our second foolish mistake, but fortunately another inexpensive one! After our daily nap, we did some more sightseeing and took some great photos of the Japanese Covered Bridge, the Chinese assembly halls, and the old merchant’s houses. We loved the long alleys in Hoi An and we had fun exploring them and finding what interesting shop, restaurant, or house they would lead to. As it got close to dinnertime, we made a reservation at a popular restaurant called Mango Rooms. After bathing in our room’s antique Chinese bathtub, we had a couple of drinks at a bar overlooking Hoi An’s liveliest street. We had a lovely romantic dinner, and afterward we went to the Cargo Club for coffee and dessert. The Cargo Club is a beautiful example of French colonial architecture, and it has an impressive French bakery. We ordered crepes with bananas, chocolate, and homemade coconut ice cream. Our cappuccinos had flowers traced in the foam, and each drink was accompanied by a freshly baked sugar cookie. I love details, and the Cargo Club paid attention to all of them. It was the perfect ending to a perfect day. In the morning we woke up at 6am and walked a few short blocks to the market on the river. We were the only tourists there. We looked at the fresh eggs, the colorful produce, and the mounds of fish still flopping around in baskets. Fishermen were drinking beers at makeshift bars after a night’s work, and women were bagging up heaps of noodles they had just made. We wandered into an aisle of food stalls that each had a counter, stools, and one or two women cooking in pots over open fires. The smells were intoxicating. We settled on the stall that had the most number of people. We sat down on a stool and our bowls were promptly filled with thin rice noodles. The lady behind the counter would point to each condiment and wait for our response. We nodded yes to every ingredient, including the mystery meat, which looked plump and juicy and fresh. The other diners cheered when I added extra chili to my bowl. We dug in to our breakfast, and to the audience’s delight, we ate everything. This was one of our favorite experiences in Vietnam and it only cost us $1.00. Later in the day we went back to A Dong Silk for fittings, and we took a boat ride down the river. After a delicious lunch at a tiny little restaurant, we picked up our new clothes, packed our bags, and sadly said goodbye to Hoi An. The small city offered a taste of Vietnamese culture, a living lesson in history and architecture, a bounty of fantastic fresh food, a beautiful beach getaway, amazing shopping, an assortment of romantic hotels, and a fun nightlife. It was perfect, especially for honeymooners. It remains the highlight of our trip. Located on the posh Dong Khoi Street in Saigon, the Hotel Majestic looks like a slice of Paris and is opulent and ornate. We stayed there because of its character and charm, and it did not disappoint. We walked all over the city and visited the quirky but informative Museum of Ho Chi Minh City. We had a tasty lunch at Quan An Ngon, the restaurant we liked so much in Hanoi, and enjoyed an afternoon swim at the hotel. In the early evening we went shopping for souvenirs and later, ate dinner at La Camargue, a French restaurant in a restored old villa with a lush courtyard and unforgettable squid ink risotto. It was a fantastic day. The next morning we hired a car and driver to take us the four hours to Mui Ne, a beach town in the south of the country. Vietnam has many beach communities, but Mui Ne has fewer tourists and is quieter than the party towns that dot the coast. We splurged on our first night there and stayed at the Victoria Phan Thiet. Our beachfront room had a private terrace, an outdoor shower, and a cold bottle of champagne as a gift from the general manager. We spent our day there in the infinity pool, sipping rum drinks while staring at the ocean. Our next two nights were spent in a beachfront bungalow at the more casual Sailing Club hotel, on the strip of beaches that is packed with resorts, bars, and restaurants. We had fun strolling up and down the beach, swimming in the ocean, and eating tons of fresh seafood. We visited the red sand dunes, and as our jeep pulled up we noticed a group of kids running up to the car. When we get out they quickly established themselves as our guides to the dunes. They each had mats which they gave us to use for sliding down the otherworldly red sand. Their ringleader, a smart and enterprising 13-year-old, took our camera and directed us to jump high and smile. He managed to take the best photo of us from our entire trip. We tipped them well, but no amount of money could buy the happiness we feel every time we look at the photo of us smiling in midair. As much as we enjoyed three glorious days of quiet and serenity on the beach, we are city-folk at heart, and so were happy to return to the Hotel Majestic in Saigon. We ate at yet another terrific French restaurant (we’ve gained 10 pounds by this point) and walked it off with shopping on Dong Khoi Street. It was our last night in Saigon, and our flight wasn’t until the following day at midnight, so we had booked a day tour of the Mekong River Delta and the Cu Chi tunnels. In the morning, we met our guide, Duc, in the lobby, and two hours later we were in Mekong City. Duc had chartered us a boat, which we first took to Coconut Island to see coconut candy being made. We were treated to a show of traditional Vietnamese songs as we ate fresh fruits and sipped tea. The boat took us to yet another island where Duc prepared for us honey cocktails with home-brewed rice wine, local honey, and kumquats. After we all got tipsy, a donkey pulled us in a cart to a narrow waterway where we were greeted by a 70-year-old woman and her small rowboat. She rowed us through a dense green jungle that mirrored what I had always imagined Vietnam would look like. It was breathtakingly beautiful. Later in the day we visited the Cu Chi Tunnels, the only war attraction we chose to see on our trip. During the American War, as the Vietnamese call it, the tunnels were used to hide soldiers and transport weapons. Today, they serve as a reminder of the strength and resilience of the Vietnamese people. The experience was moving, and oddly fun. The tunnels have become a sort of adventure activity, as one must be a bit of a dare devil to brave them. The passage that is open to tourists is extremely narrow, and once deep underground it is hot, dank, and pitch black. The communist soldier that guided us through grabbed our camera and periodically turned around to snap a photo of us hunched over, laughing, crawling through the tunnels. The irony was not lost on us. Later that night, we caught a taxi to the airport, and the meter was conveniently “broken.” We recalled the advice of our friend: “Don’t worry about the money. It’s your honeymoon, and it only happens (hopefully) once.” Choosing to honeymoon in Vietnam was the best decision, because we didn’t have to worry about the money, and for two weeks we lived like kings! We flew from city to city, stayed in fancy hotels, ate fabulous dinners, had custom clothes made, took private excursions, and still had money left over to make rookie mistakes. Through Traveler’s Joy our friends and family gifted us $2,600. Combined with the $3,000 we saved, we spent every penny. Less our plane tickets, $4,000 is a lot to spend on two weeks in a country as inexpensive as Vietnam. 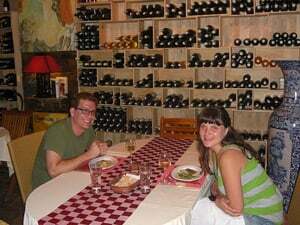 We always wanted to be able to splurge on our honeymoon, and by choosing an inexpensive country to visit and utilizing Traveler’s Joy, we lived out the honeymoon of our dreams.